There is a whole variety of different betting systems, apart from the classical cases like the Martingale or Labouchere systems. Most of these systems rely on the "Gambler's fallacy" which is an assumption that every given spin of the wheel is connected with the previous spins and will define the following spins. For example, it claims that every player's win is necessarily preceded and followed by a loss. Other systems are based on creating certain random numeric patterns and defining the size of bets according to these patterns. According to this betting system, during about 40 game sessions the player is to note four numbers that tend to come out more often than other numbers on the wheel and make bets accordingly. The fictitious character James Bond always bet on two Dozens (numbers 1 to 12 and 13 to 24 or 13 to 24 and 25 to 36, etc.) and eventually won. In reality, the probability that the two Dozens bet will win makes about 64.9% (or 63.2% for a double-zero American wheel). There is a mathematically improved counterpart for the James Bond betting system. We may assume that in each of 100 spins the player betting on two Dozens wins about 65 times (considering the above mentioned 64.9% probability). In reality, this number will either exceed our expectations or fall short of them. 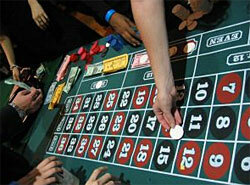 According to this system, one has to play one 100-spin game session making minimum bets. The player notes how many times he or she won in these 100 spins. With more than 65 wins, the bet size for the next session remains the same. If the number is less than 65, the size of the bets must be slightly increased. Again, this system concerns the "Gambler's fallacy" as it assumes previous results have to do with the future outcome. This is actually a bet made for laugh. The sequence of numbers 1-5-9-12-14-16-19-23-27-30-32-34 on the red spaces of the table layout resembles a figure of a snake. This may be seen as a roulette cheating system. To apply it a player doesn't have to develop any numeric sequences or patterns. In fact, an attentive and patient player only has to notice regularity with which certain numbers come out on the roulette wheel and make a conclusion that a given wheel is biased. The roulette wheel may have certain flaws in its construction. In this case it will no more be random; instead it will become biased. In reality, casinos will quickly notice that any of their wheels are biased through careful monitoring to preserve the random nature of the roulette casino game.